To be honest, doing 30 plus reviews in a month, very few submissions are that genuinely novel or entertaining to arrest my attention. The latest from Days Before Tomorrow or Rob Johnson are two examples of the best. Slow Burning Car is another. From the opening moments of Adama to the last notes of Fabians Stroll, The Scattering is a magnificent platter of entertaining melodic progressive rock. SBC began as a solo project of vocalist, lyricist and multi-instrumentalist Troy Spiropoulos which produced the first work, Blowback. With The Scattering SBC has evolved into a complete band. 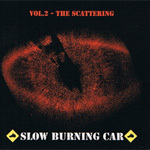 With inventive and varied styles in composition and the sometimes quirky, generally coherent lyrics, Slow Burning Car easily fits into progressive rock. Yet, this is not some obtuse or inaccessible work only understood by eclectic prog pinheads. No, those same arrangements make The Scattering a bountiful dose of hook-laden catchy melodic rock. Frankly, I have no peer comparisons for you (a comment every band longs to hear). Though not a musical comparison, in terms of creative, off the commercial mainstream inventiveness, Slow Burning Car reminds me of alt rock pioneer Tonio K (also a southern California native, I believe). Musically, The Scattering has a diverse range including space rock (Zeus), psychedelic rock (In The Trees), garage punk with a dash of AOR (Man in Crisis), near new wave throwback (Marry Me), catchy and melodic pop-like rock (Call My Bluff, Harum Scarum, First Class), or a urban hip hop rock feel (Blowback). Actually, many of these influences are present within a single song making the music even more compelling. In the end, The Scattering is a total pleasure. Slow Burning Car's The Scattering is full of surprises. It's a completely intriguing and refreshing platter of melodic progressive rock which mines a variety of styles to capture your imagination and your listening ear. Highly recommended!